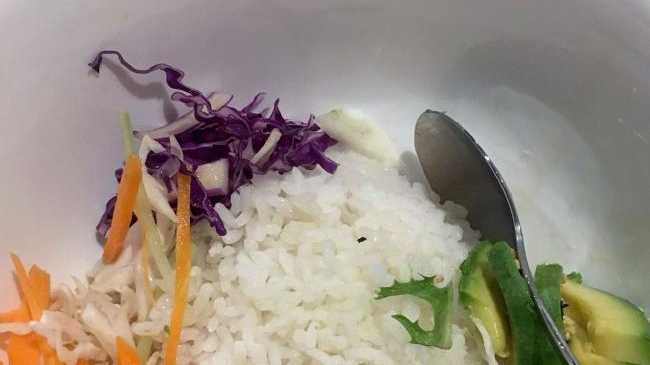 A VEGAN was left with a bad taste in her mouth after paying $22 for bibimbap which she described as being like a "prison meal". Make-up artist Loren Murnane, from Newcastle, NSW decided to eat out last Wednesday at a local Japanese restaurant which she said claims to caters for vegans. But when the 28-year-old ordered a vegan version of a bibimbap - a Korean dish of white rice, usually topped with a variety of vegetables, a fried egg, sliced meat and garnishes - the hungry mum-of-three received a meal which didn't match her expectations. Loren, who did not complain to the restaurant at the time, saw the funny side when she uploaded an image of the sorry meal to social media. Her post quickly went viral where commenters were not quite as forgiving - comparing the dish to something which might be served behind bars. Loren said: "The menu mentioned a medley of vegetables, so I thought I couldn't go wrong. "It's shocking they would serve that for $22. It was basically just a ball of rice garnished with vegetables. "I would be embarrassed to serve that! Anywhere else they serve it overflowing with vegetables. "The comments when I posted a picture were pretty hilarious. Someone was like, 'That's a prison meal!'" Loren's is not the first vegan meal to go viral for the wrong reasons, serving as the latest in a long line of disappointing plant-based dishes to spark backlash online. The mum-of-three said she was fed up with being served minimalist meals in an age where veganism is increasingly mainstream. Loren said: "This happens all the time. But vegans are not that uncommon anymore. "I'm pretty non-confrontational, so I didn't complain or anything. But I won't be returning anytime soon. "I've got three kids, so I don't eat out often. It makes it all the more frustrating when this happens!" The Newcastle restaurant, which Loren did not wish to name, declined to comment.